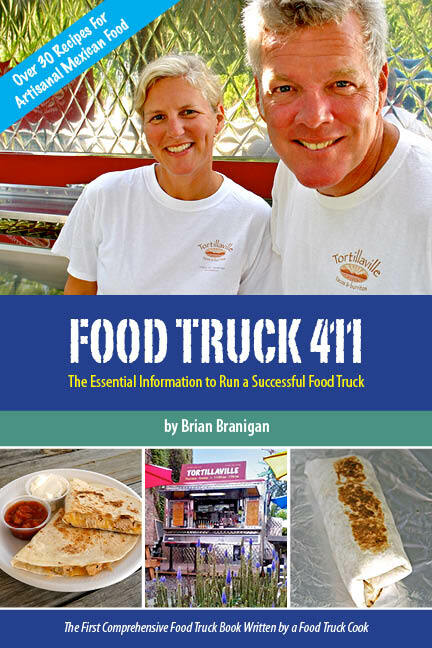 Food Truck 411: The Essential Information To Run A Successful Food Truck, is a new book written by Brian Branigan, owner and operator of Tortillaville, a popular Mexican fare food truck, located in Hudson, NY. Tortillaville co-owner and partner, Allison Culbertson, created the recipes, and the book design. Food Truck 411: the First Comprehensive Food Truck Book Written by a Food Truck Cook. Food Truck 411 is a week-in-the-life, a photo book, a cook book, and a food truck operators vantage point of life—inside the box. It is written with the intent to assist the budding food truck entrepreneur; although, anyone intrigued with the modern-day food truck trend, is certain to take interest. And, if you like Mexican food; the back portion of the book offers a generous helping of over 30 winning recipes. Those of you who are entertaining the thought of opening a food truck (or even a cafe), can confidently look to this book as a trusty and reliable road atlas. It will get you there sooner, and it will save you both time and money.